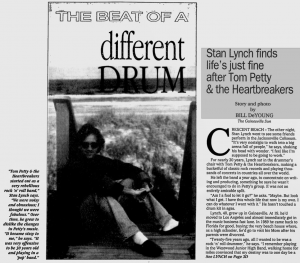 "Tom Petty and the Heartbreakers started out as a very rebellious rock 'n' roll band," Stan Lynch says. "We were noisy and obnoxious; I thought we were fabulous." Over time, he grew to dislike the changes in Petty's music. "It became sissy to me," he says. "It was very offensive to be 30 years old and playing in a 'pop' band." CRESCENT BEACH -- The other night, Stan Lynch went to see some friends perform in the Jacksonville Coliseum. "It's very nostalgic to walk into a big arena full of people," he says, shaking his head with wonder. "I feel like I'm supposed to be going to work." For nearly 20 years, Lynch sat in the drummer's chair with Tom Petty & the Heartbreakers, making a bucketful of classic rock records and playing thousands of concerts in countries all over the world. He left the band a year ago, to concentrate on writing and producing, something he says he wasn't encouraged to do in Petty's group. It was not an entirely amicable split. "Am I a fool to let it go?" he asks. "Maybe. But look what I get. I have this whole life that now is my own. I can do whatever I want with it." He hasn't touched a drum kit in ages. Lynch, 40, grew up in Gainesville. At 19, he'd moved to Los Angeles and almost immediately got in the music business fast lane. In 1989 he came back to Florida for good, buying the very beach house where, as a high schooler, he'd go to visit his Mom after his parents were divorced. "Twenty-five years ago, all I wanted to be was a rock 'n' roll drummer," he says. "I remember playing in the Westwood Junior High Band, walking home for miles convinced that my destiny was to one day be a big time rock 'n' roll drummer. "Now I have the very same commitment to a new dream." The fuits of his most recent labors arrive in record stores today. "Actual Miles" is a greatest-hits record by sometime Eagles member Don Henley; Lynch co-wrote and co-produced four of the album's 13 songs, including the stunning, apocalyptic single "The Garden of Allah." The first Henley/Lynch collaboration, "Driving With Your Eyes Closed," appeared in 1985. Last year, they co-wrote the Eagles' hit "Learn to Be Still," on an album that sold more than seven million copies. "We have very full lives without each other," Lynch chuckles, "but I find being around Don is pretty invigorating; it's exciting for me. I think he's an intelligent, humorous character. I think he's hysterical. He's a real source of entertainment for me." Henley, reached by phone from Tokyo, where the reunited Eagles are touring, says much the same around his sometime partner. "He's one of the funniest people I ever met," Henley explains. "And that is very important when you've been in the studio for two or three months. Things get a little grim after working 14-, 15-hour days in a little room with no windows, hearing the same song over and over again." "It's good to have some laughs, and Stan always provides those." Henley, Lynch counters, "is a complex guy. He's my senior by eight years, and he's like my big brother; so everything I go through it seems like hes already been through." "I know it's been a rough year for him, and I think he's handled it very well," says Henley. "And I think this project has helped him to cope with it. "I remember how I felt when my group broke up -- I went through an entire gamut of emotions, from anger to fear to hurt to panic." "The Garden of Allah," more than seven minutes long, is a narrative in which Satan comes to L.A. ("Gomorrah-By-the-Sea") and discovers that it's too depraved, even for him. Henley's voice rides a wave of gritty and incessant electric guitar riffing and eerie background vocals by Sheryl Crow. 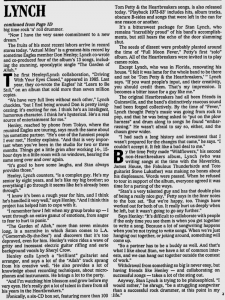 Henley calls Lynch a "brilliant" guitarist and arranger, and says a lot of the "Allah" track sprang from his creative well. "He also provides a lot of knowledge about recording techniques, about microphones and instruments. He brings a lot to the party. "And I'm watching him blossom and grow before my very eyes. He's really got a lot of talent in there from all his years in the Heartbreakers." Ironically, a six-CD box set, featuring more than 100 Tom Petty & the Heartbreakers songs, is also released today. "Playback 1973-93" includes hits, album tracks, obscure B-sides and songs that were left in the can for one reason or another. It's a bittersweet package for Stan Lynch, who remains "incredibly proud" of his band's accomplishments, but still years the echo of the door slamming shut. The seeds of dissent were probably planted around the time of "Full Moon Fever," Petty's first "solo" album. All of the Heartbreakers were invited in to play cameo roles. Except Lynch, who was in Florida, renovating his house. 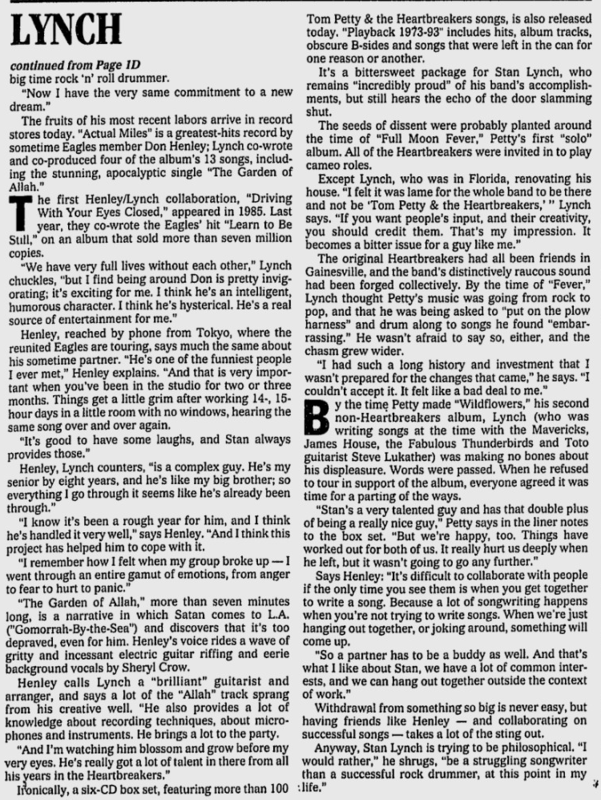 "I felt it was lame for the whole band to be there and not be 'Tom Petty & the Heartbreakers,'" Lynch says. "If you want people's input, and their creativity, you should credit them. That's my impression. It becomes a bitter issue for a guy like me." The original Heartbreakers had all been friends in Gainesville, and the band's distinctively raucous sound had been forged collectively. 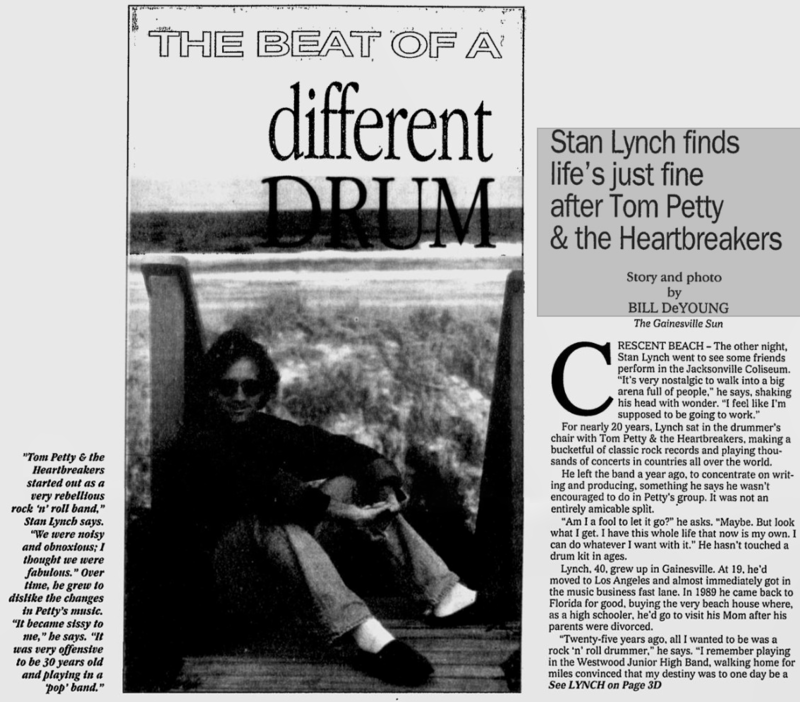 By the time of "Fever," Lynch thought Petty's music was going from rock to pop, and that he was being asked to "put on the plow harness" and drum along to songs he found "embarrassing." He wasn't afraid to say so, either, and the chasm grew wider. "I had such a long history and investment that I wasn't prepared for the changes that came," he says. "I couldn't accept it. It felt like a bad deal to me." By the time Petty made "Wildflowers," his second non-Heartbreakers album, Lynch (who was writing songs at the time with the Mavericks, James House, the Fabulous Thunderbirds and Toto guitarist Steve Lukather) was making no bones about his displeasure. Words were passed. When he refused to tour in support of the album, everyone agreed it was time for a parting of the ways. "Stan's a very talented guy and has that double plus of being a really nice guy," Petty says in the liner notes to the box set. "But we're happy, too. Things have worked out for both of us. It really hurt us deeply when he left, but it wasn't going to go any further." Says Henley: "It's difficult to collaborate with people if the only time you see them is when you get together to write a song. Because a lot of songwriting happens when you're not trying to write songs. When we're just hanging out together, or joking around, something will come up. "So a partner has to be a buddy as well. And that's what I like about Stan, we have a lot of common interests, and we can hang out together outside the context of work." Withdrawal from something big is never easy, but having friends like Henley -- and collaborating on successful songs -- takes a lot of the sting out. Anyway, Stan Lynch is trying to be philosophical. "I would rather," he shrugs, "be a struggling songwriter than a successful rock drummer, at this point in my life."